Large animal migrations are among the primordial rhythms of life on Earth, and, as scientists have recently discovered, the American West is home to some of the planet's most magnificent migrations. 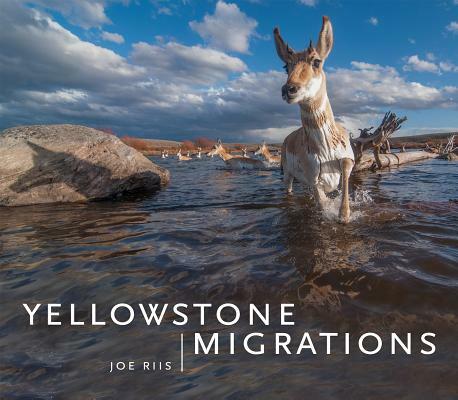 Yellowstone Migration takes readers into the heart of the vast, wild landscapes found in America's West, and shows us that it is possible to preserve the natural heritage of this iconic region and protect these last intact natural wildlife corridors--so that these animals can carry out the migrations that are essential to their survival. The Greater Yellowstone Ecosystem, which is a dozen times the size of Yellowstone National Park, harbors the last great populations of migrating elk, pronghorn antelope, and mule deer. Thousands of these grand animals move with the changing seasons to feed and give birth. During their four-month long journey, mule deer navigate not only the natural challenges of rivers, lakes, and sand dunes, but also manmade obstacles such as three major highways and more than 100 fences, many with barbed wire. - The Cody elk migration on the Absaroka front. People who care about the American West face a choice: we can manage our public and private lands in ways that allow and encourage these migrations, or we can encumber these animals with unchecked development, changing climate, pollution, and barriers. Riis's stunning imagery and on-the-ground experiences shed light on these amazing animals and how, for them, migration is a matter of life or death.